Obviously inspired by Willy Wonka, McVitie's, a baked goods company in the UK, decided to make the edible magic real by turning an entire elevator... lickable. Yes, lickable. There are 1,325 lickable cookies lining the wall which you can lick up and down as you go up and down. This is gross, right? I shouldn't want to ride this elevator lined with Jaffa Cakes, which is apparently a sponge cake with orange jelly and chocolate, should I? But look at the people licking! They make it look so damn tasty. 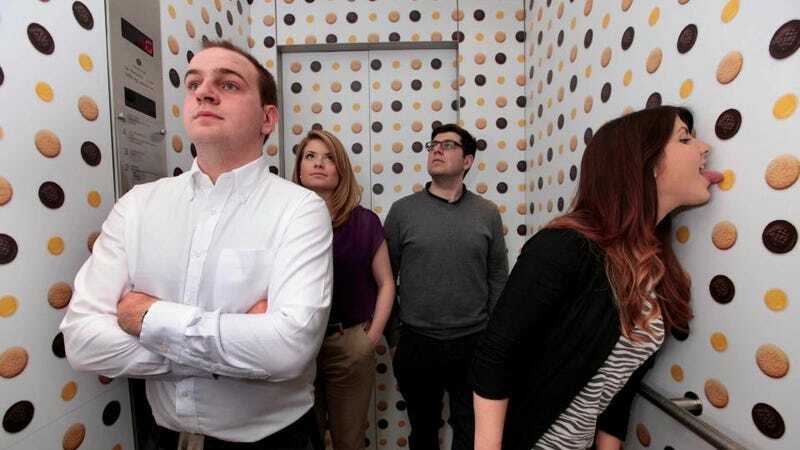 The 1,325 Jaffa Cake wallpaper took about a month to install and is housed in an elevator in London. It's all an advertisement, of course, but damn if I've ever seen a tastier one. You would lick it, right? Right?! I'm not a disgusting human being for wanting this, am I? This guy really wants it.